The beauty of this product is it just drops straight into an industry standard 80mm hole, making it discreet and perfect for upgrading pre-existing standard grommets. 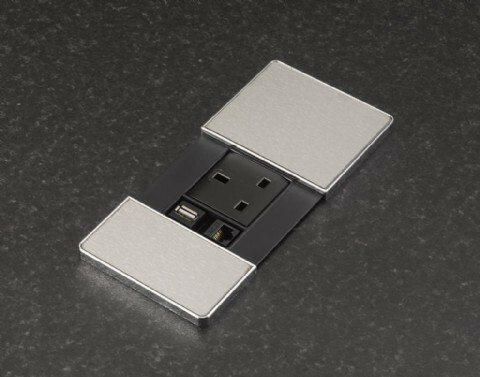 This particular model has a powered 5v USB socket perfect for charging USB compatible devices. There are numerous finishes available, including a Sprayed Metallic Silver top, which due to the design having a recess in the top, you can also insert your own infill, so for instance you could drop a piece of laminate into the recess to match the rest of your worktop. As with most of our products, variations and specials can be made available, although minimum order quantities would apply. Similarly, you can also have different configurations such as hdmi etc, if you're wanted to swap out an existing feature for an alternative (subject to moq's!). Is it possible to purchase a replacement cover for this socket?